Do the total assets in your balance sheet amount to the same as the total equity and liabilities? Is the result of your cash flow statement equal to the movement of cash in your balance sheet? Do percentages sum up to 100%? Do user inputs make sense, e.g. does a project's construction phase finish before its operating phase? Are dividends only paid out when cash is positive? When you have some experience with Excel, you have probably come across a lot of rounding errors when calculating decimal numbers - sometimes in the 8th, 9th, 10th digit after the decimal point. The reason is that computers calculate using binary representations, and sometimes this can lead to inaccuracies with decimal numbers. Without going into too much detail, there will be cases in which a sum should be 0, thus letting your check result in "OK" - but instead, due to Excel inaccuracies, the sum is something like 0.00001034, and you receive an "ERROR". In order to avoid this, it is highly recommended to define a tolerance level. This could be done on one of your general input sheets - you should then assign the range name Tolerance to that input cell. Having done that, you can now use that tolerance level in your checks. The principle of summing up checks does not only apply to single sheets. 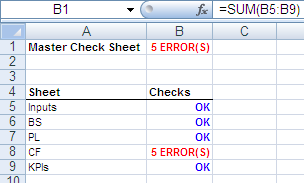 You can sum up your per-sheet sums on one "Master Check Sheet" and ultimately form a sum that tells you if all of your model checks result in "OK" or whether there are one or more errors. By including the # sign, you tell Excel to show the number that is stored in the cell, followed by ERROR(S). When deciding which checks to include, you need to distinguish between actual error checks and model outputs. For example, when you model a project's business plan that includes taking up a bank loan, it is very common to show the interest cover (or sometimes called debt service coverage ratio, DSCR) for each period. For user convenience, your calculation should highlight critical values for the DSCR, i.e. when it comes close to or even falls below 1 - that would mean the project EBIT would not suffice to serve the bank interest. However, a check like this should not be shown as an error because it does not mean the model as such is incorrect: It only means that under the given assumptions, the project would not be profitable enough. Make sure to treat this and similar checks as model outputs, not as error checks.